Our block paving repair and sealing service is to important to restore your block paved driveway or patio back to a pristine condition. Maintaining your block paving on a regular basis is vital, as without regular cleaning, driveways and patios can become dirty. 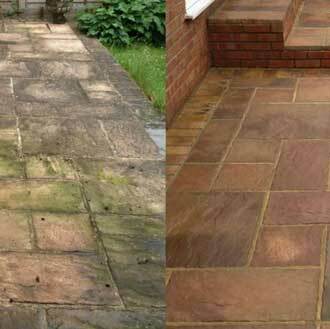 Damp weather can attract algae, moss, lichen and weeds to grow on your driveway and patio block paving and slabs and in the joints. 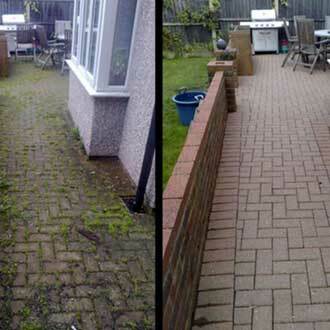 This in turn can cause the block paving and other areas of the driveway or patio to become cracked, sink or raise up. After cleaning kiln dried or silica sand (block paving sand) is brushed lightly over the block paviers and drops down between the blocks. After cleaning your paving we use a sealant which will allow your driveway to maintain its good looks for longer. The sealers are available in a variety of finishes. We only use the best quality tried and tested sealers as we have found their performance is second to none. Applying a block paving sealer is a way of protecting your block paving investment from contaminates, such as moss, weeds and oil. Block paving sealers have many benefits over untreated block paving, rather like a wax on a car, sealers keep dirt, moss and algae off you paving. They help with the removal of oil and tyre marks by providing a barrier of resin that sits on the surface of the block pavers, making them easy to clean.